Chris Pratt Guardians of the Galaxy and clairvoyant? 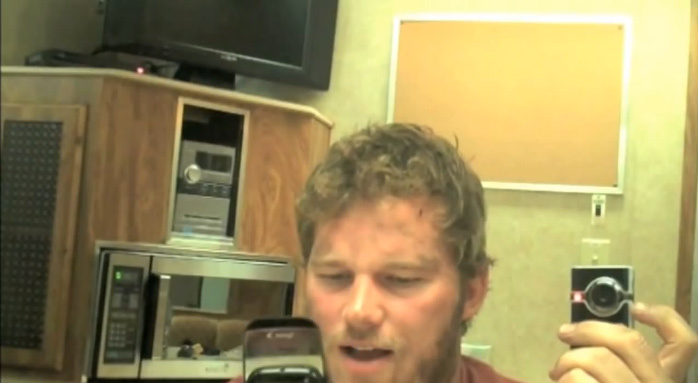 While shooting a behind-the-scenes featurette for NBC’s Parks and Recreation: Season 2 DVD, a scruffy Chris Pratt pretends to receive a text message from director Steven Spielberg. What really makes the video interesting is that Pratt jokingly predicts his own Jurassic World aka ‘Jurassic Park 4’ casting four years before it actually happened. “Man, I just got a text message from Steven Spielberg. God, so annoying,” Pratt jokes while pretending to reply. “Sorry Steven, I was asked by ‘Parks and Recreation’ slash NBC to do behind-the-scenes which is to say everyone else was asked and said ‘no’ but I have no shame as you know by the endless gift baskets. I’ll have to get back to you later about ‘Jurassic Park 4’ boom!” Check out the video using the player below! Pratt can currently be seen on the big screen in Marvel’s Guardians of the Galaxy now playing in 3D, IMAX 3D and conventional theaters.